As a new documentary by Pablo Navarrete, Jody Mcintyre and Lowkey is being released this summer, Derek Oakley went to a special screening of Navarrete's earlier film "inside the revolution" and reflects on its depiction of Venezuela, Chavez and the people living revolution. To many people in the present day, mention of Venezuela brings to mind one man and one man only: Hugo Chavez (below). Authoritarian dictator to much of the West, socialist hero to dissidents across the Global South. In his documentaries about this conflicted, dynamic country and its 27-million strong population, film-maker Pablo Navarrete seeks to tell some of the individual stories behind the headlines, so as to put the Bolivarian Revolution that Chavez has come to symbolise in perspective. A recent event at the Victoria in Dalston (East London) featured the first of these documentaries and gave a tantalising glimpse of what the upcoming second has to offer, while also making space for debate about the complexities and contradictions of revolutionary struggle in Latin America and its implications for the wider world. It also looked at the role of the media and art in both shaping and challenging public perceptions of the region, poverty and inequality and the position of young people in Venezuela society. ‘Inside the Revolution: A journey into the heart of Venezuela’ (2009) showcases the experiences and perspectives of four Venezuelans. From a party organiser out canvassing votes to a young rapper committed to exposing the ongoing corruption in government bureaucracy. 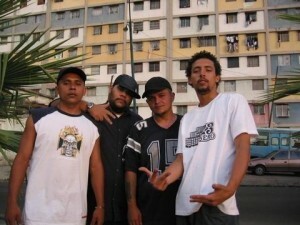 In doing so, the movie references to the landmark uprisings of the late 1980s that, similar to much unrest across Latin America in recent decades, from Bolivia to Argentina, was sparked when the government began to implement IMF imposed programmes of cuts to public services and benefits. Mixing archive footage with first hand interviews Navarrete shows the audience a massively divided, racist and unequal country where since independence from Spanish colonialism a small elite controlled the media as well as enjoying the revenues from the primary resourse of oil where by popular protest became the only option for the disenfranchised poor. The Caracazo, as it was known, saw hundreds of undocumented deaths at the hands of the police but though the initial disturbance died down, the seeds of a revolution had been sown that found a focal point in the charismatic figurehead of Hugo Chavez. 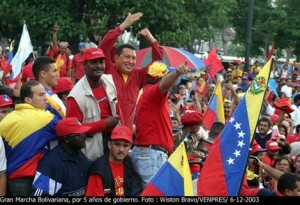 The film demonstrates clearly the boldness and impact of several key policies enacted under Chavez. While the nationalisation of parts of the oil industry, agarian reforms that redistributed land and massively increased public spending (which tripled between 1998 and 2008) have significantly reduced poverty and funded improved healthcare and education, the key pillar of reform that features strongly in the film is the 1998 constitution. This was a radical new step toward devolved decision making and representation that empowered millions of Venezuelan citizens to take more control in their own lives. This allowed such radical measures as the creation of Communal Councils (approximately 30,000 nationwide to date) that act as local governance mechanisms, empowering citizens from neighbourhood level up. In rural areas these have been complimented by the formation of cooperatives that mobilise groups of local farmers to maximise the productivity and sustainability of agriculture. 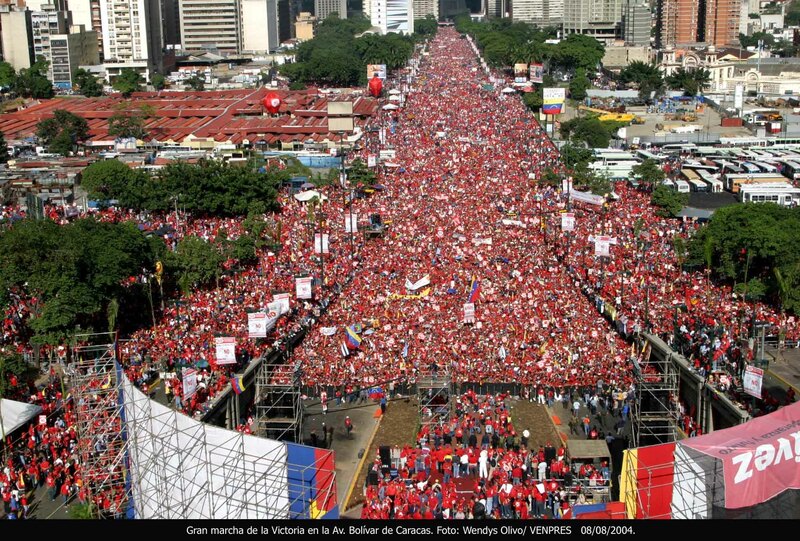 Alongside the US backed 2002 coup attempt against Chavez facilitated by the corporate media (covered in depth in the documentary ‘The Revolution will not be Televised’), it is the Constitution and the ongoing possibilities it opens up for Venezuelans regardless of who the president or ruling party is that seem to have cemented popular support for Chavez, as demonstrated in repeated election and referendum victories, reflecting a clear break not only from the legacy of successive corrupt regimes since the late 1950’s, but from intrusive US influence. The film charts the evolution of discourse employed by Chavez from a more centrist ‘Third Way’ of compassionate capitalism in the late 1990s to his 2005 declaration of the need for ’21st Century Socialism’ while also noting both his capacity to forge internal and external alliances that strengthen his hand in building sustainable change in the face of remarkable opposition. The active participation of different personalities and parties in successive governments, balancing a more authoritarian ‘internal right’ with radical socialists, gives him a broad power base at home. The building of progressive regional alliances such as ALBA and SELAC suggest South-South cooperation, although predictably some foreign theorists highlights both the contradictions of the transition that Venezuela is undergoing and the possibilities of the project. However it is the first hand reflections of individuals like the rapper Master, who is shown performing for and embracing Chavez on live television before his group launch into a song criticising government corruption, that give the most insight into this very special revolution. Master’s work with young people, using Hip Hop alongside political education and participation, forms the core of the upcoming film ‘Hip Hop Revolucion’, the production of which saw Pablo team up with journalist Jody McIntyre, who co-directs, Kareem Dennis (until recently best known as the rapper Lowkey) and Hip Hop video visionary Global Faction during a visit last year. In discussion after the screening they described how their intended focus on a comparison between the funding of Higher Education in Veneuela and the UK, the original hook for the film, was rendered redundant (as Pablo puts it “The Story took over”) by a powerful visit to one of 33 Hip Hop Schools set up by Master. The power of culture as a battlefield where revolutionary sentiments can tackle the reactionary status quo head on, as well as helping individuals to find their voice within the present and future of their society, was a notion echoed across the panel, which also featured Katriona Goss of the Venezuela Solidarity Campaign and Producer/Writer Carlos Martinez (aka Agent of Change). With a large number of young people present in the audience, discussion raised compelling questions about, among other things, both the difficulty of sustaining a revolutionary culture across generations and the problematic nature of creating art that captures one cultural experience in a form pioneered in another. In this instance Hip Hop was observed as an American form of expression, albiet one pioneered by African American and Latino voices and with much deeper cultural roots. The picture painted by the panel was of a Venezuela far from overcoming entirely it’s internal inequalities and contradictions but enriched by a pluralistic and communal approach to both education and decision making. The prevalent image of the Chavez government is not an accident but a construct presented by powerful forces in Caracas, in Washington and even here in London whose interests it opposes, not only in presenting economic alternatives, but in devolving democracy in a fashion scarcely seen elsewhere. This form of participatory democracy runs contrary to the polished, high minded ideal of Liberal Democracy presented by the West as inherently superior to other traditions and models. In connecting with the ordinary people at the heart of the revolution and amplifying their voices , Navarrete and his colleagues are opening up opportunity for us to make our own minds up about Venezuela. Make sure you grasp that opportunity with both hands when ‘Hip Hop Revolucion’ is released later this summer. Derek Oakley is a peace worker, trainer and writer. A director of youth organisation Free Radicals, he takes a strong interest in radical art, civil society movements, Africa and Middle Eastern Politics. He is currently participating in the EAPPI programme in the West Bank with the World Council of Churches. He blogs at Critical Path and Yanoun.